US billionaire George Soros has more than doubled his investment in gold, despite calling it the "ultimate bubble" just weeks ago. 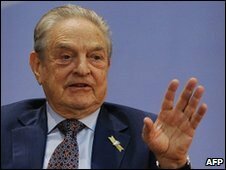 Mr Soros' investment vehicle Soros Fund Management increased its holding in SPDR Gold Trust to 6.2 million shares, worth $663m (£425m) at the end of 2009. It had held 2.5 million shares at the end of the third quarter of 2009. The gold price hit a record high of $1,226.56 an ounce in December, but has since fallen back to about $1,100. Mr Soros himself has suggested that gold may not be a good investment. At the World Economic Forum in Davos last month, he said: "The ultimate asset bubble is gold." However, he did not say whether he was investing in the precious metal. But he also said that when he sees a bubble, "I rush out and buy". Mark Heyhoe, senior mining analyst at Westhouse Securities, said: "He has previously said that gold is the ultimate hedge against inflation - if you think inflation's going to rise, then I'm not surprised he bought into gold. "A lot of people were starting to look at gold, and a lot of people follow what he does," he added. "But you need to buy a lot of gold to shift the price." As well as raising its stake in SPDR, Soros Fund Management also increased its holding in Canadian gold producer Yamana Gold. The company also bought more shares in seed producer Monsanto, Brazilian oil producer Petrobras, and Wall Street bank Citigroup.